Now you can add videos, screenshots, or other images (cover scans, disc scans, etc.) 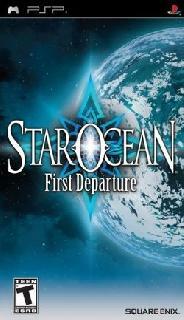 for Star Ocean - First Departure (USA) to Emuparadise. Do it now! If you haven't noticed yet, we have a retro game of the day feature (top-right of the screen) wherein we feature a new retro title every single day! Now, you can vote for your favorite games and allow them to have their moment of glory. 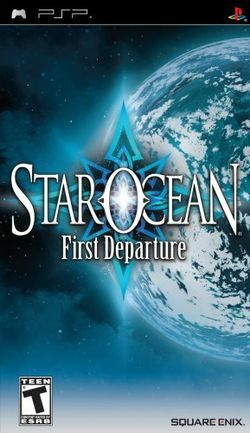 Click on the button below to nominate Star Ocean - First Departure (USA) for Retro Game of the Day. ______ /\__________________________ __________ __/\ _______ .____\ \/ / _ / _ \/ _ \/ \/ / | \ // / / / / / // \/ / _ | \ / _______/ / // _/ / / // rtx/ | VENOM \\ /\__________/_____/_____/\____\_____/______/_____/ /art : \ / `-------- \ / --> Proudly Presents: Star Ocean: First Departure \/ Publisher.....: Square Enix Platform......: Sony PSP Developer.....: Tri-Ace Origin........: U.S.A. Release Date..: October 21, 2008 Size/Format...: *.ISO (UMD) -- Release Notes ----------------------------------------------------------> The STAR OCEAN saga comes to life in the completely remastered Star Ocean First Departure, developed exclusively for the PSP. Featuring a revised game engine, improved battle system and fully voiced, all-new animated scenes displayed in 16:9 widescreen, players can now follow the exploits of humankind's journey across the stars in an adventure that has never before been released to the North American audience. Requires firmware version 4.05 or later. Tested with the latest 5.0 M33. -- Greetings --------------------------------------------------------------> Capital. Dual Crew Shining. Echelon. Eptiso. Kalisto. Menace. Mode Seven. __ ------------------------------------ \/ -----------------------------------> "The Playmakers"